UPDATE: Based on the comments below, many of you were curious as to what “standard add-a-line pricing” would be after the promotional period ended, so we went out and confirmed it with our ninjas. After January 1st, 2012, $0 promotional lines will have a monthly fee of $5 for Even More Plus 750 min/1500 min/3000 min; $10/month for Even More 750 min/1500 min/3000 min and Even More Plus 200 min; and, lastly, $15/month for Even More 200 min plans. Remember that $0 Add-A-Line Family Plan Promotion we told you about last week? Well, it’s definitely coming and, thanks to our ninjas, we’ve got exclusive details on the promotion. 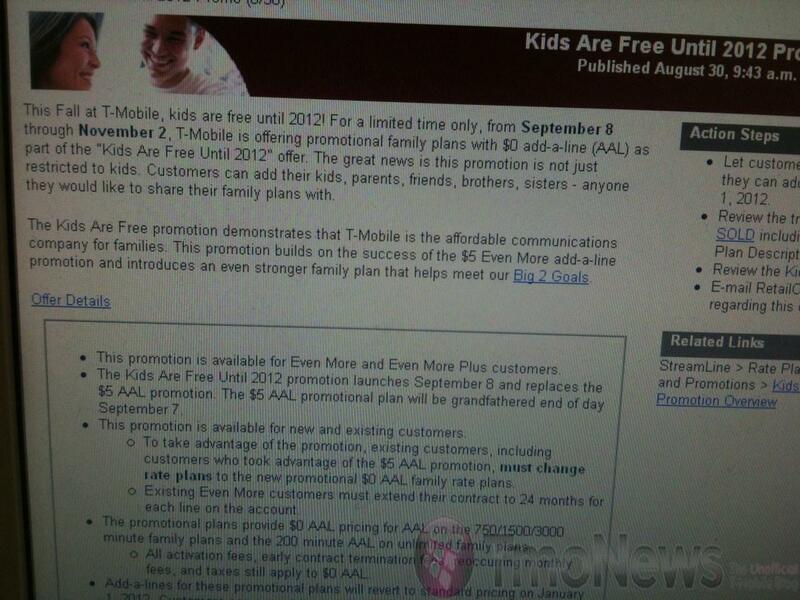 Beginning this Fall, Magenta will be running a new promotion called “Kids Are Free Until 2012”. This promotion, as we’ve stated last week, will run from September 8th through November 2nd, with the current $5 promotional plan becoming grandfathered at the end of September 7th. The promotion (which isn’t just restricted to kids) will allow customers to add an additional line for the best price of all, $0 (yes, free). But there are some requirements/restrictions. The offer is available to both new and existing Even More and Even More Plus subscribers. 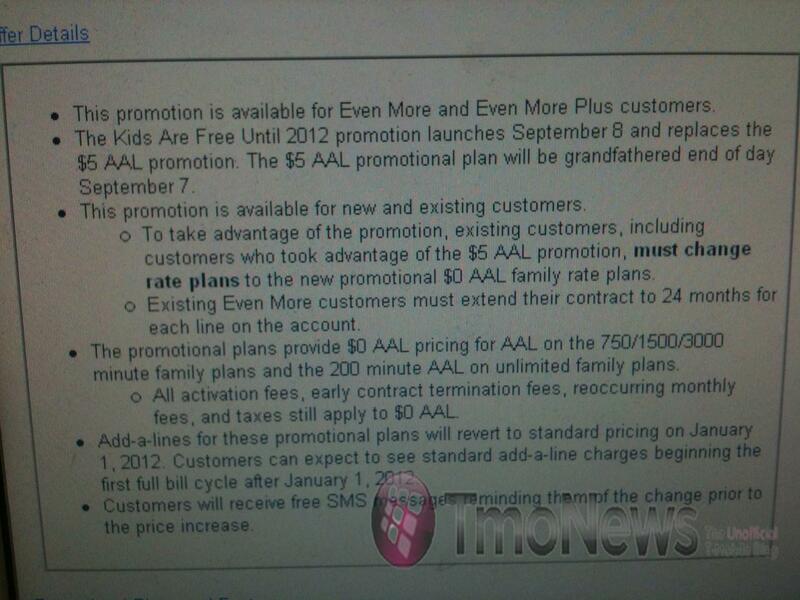 To take advantage of the promotion, existing customers must change to the new promotional $0 add-a-line family plan. Additionally, Even More subscribers will have to extend their contracts 2 additional years for each line on the account. The offer is only valid on the 750 min/1500 min/3000 min family plans and 200 minute unlimited family plans. Activation fees, early termination fees, and taxes still apply to this offer. On January 1st 2012, the $0 promotional price will revert back to standard add-a-line pricing. T-Mobile will notify customers via a free SMS message prior to the price change. Pretty sweet deal, if you ask me! What say you? This will be great for us. Gonna change our numbers after moving, now we can keep our old numbers during the switch, then keep two extra lines for the kiddos when they are old enough to have phones. I like it! No just extend your contract for additional 2 yrs to receive this promotional price plan. No need to change your phone number if you have tmo already. As usual it should no affect your phone upgrade tenure. @lava, T-Mobile cannot forward calls from a number once it is removed from your account. Additionally, you are not required to change numbers just because you moved… it’s only if you want to pay to change them. I explained this to a poster lower in the thread, that it’s not advisable to do business here in Hawaii unless you have an 808 area code. Outsiders are frowned upon here and are viewed as “one-year wonders”. So for me it is a requirement. And not everyone here has free long distance plans, especially on long distance. No Vonage here either! Anyways, the last time I inquired about changing numbers (before moving), T-mobile said they would forward calls from my old number for 30-days or until it was reassigned, whichever was shorter. If this has changed, then I stand corrected. why not set up a google voice number in the new area code that forwards to your existing number and not worry about changing it at all? So wait – I’m confused – does this mean that if I were to add a line for $0, it would go back to $5 in January? So I save like $20 in exchange for selling my soul for another 2 years? Ah yes. Reading fail. Thanks. If I understand this correctly, then the $5 AAL promotion will end Sept 7th, but I’ll be able to keep this plan since I have it currently. Or if I choose, I could switch my $5 AAL to the $0 AAL plan (re-upping on a new 2 year contract) for a savings of $75 during the term of the promotion, but then in 2012 I’ll start paying the normal AAL fee of $10 correct? So, I’ll loose my savings in the same amount of time that I earned it? I guess it works if you are starting from scratch, but otherwise, this seems like a better deal for a new line, not preexisting ones (not that there’s anything wrong with that), am I correct? This makes me wonder…is the current AAL plan of $5 temporary or permanant? I have 5 lines on my account. So I’ll save $240 until January 1, 2012, then jump up to $30 more per month? Do you know if older grandfathered rate plans are eligible to add a line for free? The only sure way to avoid charges for the additional lines for children is to not get them a phone. I didn’t have one until I was 30 years old….. Of course, that was back in the stone age. My great, great grandfather said I didn’t need a car because he did not get one until he was 40. But that was when people were just then starting to leave the horse at home and take the car instead. So I discounted his example. Of course, your admonition has been duly noted by all struggling fathers out there, especially the ones who grew up in areas where it never snowed. Not a good deal for existing customers: have to change a plan, re-up the contract and you don’t even get to keep it indefinetly. I’ll pass. Great deal for a new customer though. what about the loyalty plan (unlimited everything family plans)? can we add lines for free as well? Unless we change our plan from Unlimited Loyalty to EM or EM+ right? Is there such a thing as the unlimited everything family plan? If so, how much is it. I only have 2 lines. 140 off contract and 180 on contract. cool, i guess but…David you gotta get us some more g2 news…im dying over here. You have to do everything with in your power. Use all your connections and sources. You have to be the chosen one who will blow the lid off the g2. WE NEED VIDEO!!! Trust me Manny, we’re all doing what we can…believe me, we want to be the ones to break news on this phone so we are trying!! I will see what I can do…. Too bad it ends January 2012 instead of 2013, for those who would have to sign a 2yr contract and only have to offer for 14/15 months and have to start paying on the added lines for the remaining 9/10 months. Unless they’re giving away free phones to go with those lines, this sounds like trash. Why would this be considered trash? spew your idiocy else where. hmmm… there is that back to school promo I heard about… you know the one with free phones? It’s unfortunate the contract extension lasts longer than the promotional pricing. Make them both equal and I’ll add my Mom on there. you’re still getting a free 3rd/4th/5th line for free for 15 months if u sign in september…..thats crazy ridiculous….who cares if you have to pay 5/10$ for another 9 months…..still crazy cheap. so right now i believe that my family is paying $10 per extra line. We have 3 extra lines. With this promotion will the price for the extra lines be $0? What you should do is call T-Mobile and have them do the $5 add a line before it goes away. Then you save $15 per month and it doesn’t expire. But if you choose to take advantage of this new promotion, then yes…$0 for the 3 extra lines, but it ends January 2012…where it may go up to $10 per line. Who knows. I actually pay more if I take their offer. My $3.99 T-zone is gone, my $4.99 txt package is gone. Nice try T-mobile! Nice try? This promotion is aimed at new customers, not people on 3 yr old grandfathered features. Relax. It’d be even sweeter if it worked on the older grandfathered plans. I don’t think the 5aal is going to disappear. Its will be back after this promotion ends…no worries. And they are other surprises as well . I’m not sure why lava (way up the comment chain) wants to get new numbers because he’s (she’s?) moving. I moved from CT to MD (860 area code to 410) almost 5 years ago and never changed my cell numbers. No one cares, friends from before and family didn’t have to learn new numbers and new friends here don’t care. Most cell plans and many landline plans don’t charge for long distance so the cost is a wash as well. Hey, when are we going to hear more about Vibrant BOGO? is that real or rumor? 9/8 is getting close so we should be hearing about it if its real. your “most” and “many” point is correct. Not all the people I work with and deal with have plans that don’t charge long distance. Not to mention, I live in Hawaii, where there is one single area code, and outsiders are those “one-year wonders” who have area codes other than 808. understand now? Sept 8th – Nov 2nd, Vibrant goes to BOGO. You heard it here first. Ooooooooooh Really, whats your source? Many famillies will be excited about this. I remember how customers where excited about the $5 ad a line promotion. This one will bring a larger number of new lines. I have a family plan with 700 minutes, with 3 lines. I am planning on switching to the 750 EMP plan this month. Can I do that switch before 09/08, and get my 3rd line for $5, then on 09/08, ask for my 3rd line for free, so when the promotion ends it will be $5 rather than the $9.99 it is now? Yes, but that doesn’t make much sense. Just add the line when the $0 promo starts, and it’ll switch to whatever the standard AAL charge is in January 2012, which I can’t imagine will be more than $5 since T-Mobile is focusing on families right now. I know a lot of people who are going to like this. Further down the page on streamline it says that the charges will be $5 for the added lines after Jan. 01, 2012. If I am on EM+ family plan w/ 5 lines (3 of them requiring $5 per/m = $15 per month) does this mean I can switch those 3 existing lines to $0 per/m until 2012 and then it will raise back to my $5 per/m afterwards? so for even more plus plans, do you add a 2 year contract as well? So you couldn’t afford the extra 50 for an Epic ? Enjoy your outdated discounted snapdragon phone. If it makes you happy that’s great. Dar and TangoPapa both asked about existing AAL’s and whether they could be counted as AAL’s for this promotion instead of getting new ones. Doesn’t seem to me like they would be eligible. But I don’t know. Anyone know? Is it possible to add a $0 3rd line on an EM+ famlily plan with flexpay? What about a 4th, 5th AAL under this plan for EM+ flexpay? So let’s say I open a new account with TMO during the promotional period of SEPT 7-NOV. I get the $0 add a line feature, but will it increase to $10 afterwards? If that is the case, wouldn’t it be better to just go for the $5 per line before they “grandfather” it. I mean if you think of long term lessay 3-5 years with TMo, then the $5 would be the plan that will save more in the long run. Am I correct thinking this way? UPDATE: Based on the comments below, many of you were curious as to what “standard add-a-line pricing” would be after the promotional period ended, so we went out and confirmed it with our ninjas. After January 1st, 2012 $0 promotional lines will have a monthly fee of $5 for Even More Plus 750 min/1500 min/3000 min; $10/month for Even More 750 min/1500 min/3000 min and Even More Plus 200 min; and lastly, $15/month for Even More 200 min plans. Just in time for me to add that G2!! Hellz yeah! So, for us existing Even More Plus subscribers, we get to pay another $35 activation fee for both primary lines to switch to this promotion? I have 2 add-on lines and 2 primary lines, so it will cost me $70 for re-activation on the primary lines, and I’ll save $10 off my monthly bill for 1 year. So total savings equal $50 for 1 year. $10 per month X 12 months = $120 – $70 for activation. Not worth my time. Also, I wonder what their “Big 2 Goals” are on the leaked picture link? ive been with them since 1997, they will waive the activation and give you better pricing on the phones if you ask, when they pull up the account they will if you ask send you to a “specialist” and they will make a better offer for you. this promo should have started today – has it been delayed or did they cancel? there wasn’t an update here so thought it wasn’t happening. thanks for update – just added new line.